Definition at line 37 of file llmemoryview.h. Definition at line 53 of file llmemoryview.cpp. References FALSE, mDumpTimer, LLFrameTimer::reset(), and LLView::setVisible(). Definition at line 67 of file llmemoryview.cpp. Definition at line 148 of file llmemoryview.cpp. References bottom, mtv_display_info::color, mtv_display_info::desc, LLView::draw(), dumpData(), f, LLRectBase< Type >::getHeight(), LLFontGL::getWidth(), LLRectBase< Type >::getWidth(), gl_rect_2d(), height, i, LLFontGL::LEFT, left, llformat(), llmax(), mtv_display_info::memtype, LLView::mRect, MTV_DISPLAY_NUM, LLMemType::MTYPE_NUM_TYPES, LLMemType::MTYPE_OTHER, LLFontGL::renderUTF8(), right, S32, LLColor4::setAlpha(), LLFontGL::sMonospace, LLMemType::sTotalMem, LLFontGL::TOP, top, LLColor4::white, width, x, and y. Definition at line 267 of file llmemoryview.cpp. References LLFrameTimer::getElapsedTimeF32(), i, llformat(), mDelay, mDumpTimer, LLMemType::MTYPE_NUM_TYPES, LLFrameTimer::reset(), S32, LLMemType::sMaxTotalMem, and LLMemType::sTotalMem. Definition at line 76 of file llmemoryview.cpp. Definition at line 71 of file llmemoryview.cpp. 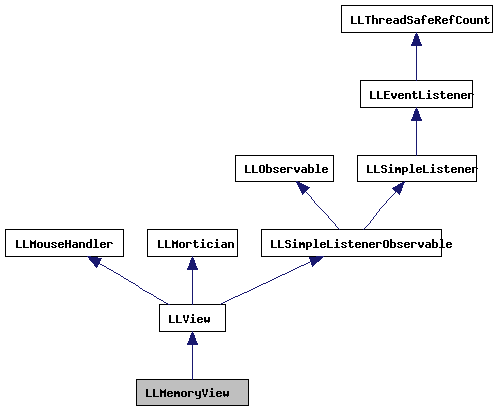 Definition at line 101 of file llmemoryview.cpp. Definition at line 81 of file llmemoryview.cpp. References MASK_CONTROL, MASK_SHIFT, and TRUE. Definition at line 95 of file llmemoryview.cpp. Definition at line 262 of file llmemoryview.cpp. Definition at line 55 of file llmemoryview.h. Referenced by dumpData(), and setDataDumpInterval(). Definition at line 56 of file llmemoryview.h. Referenced by dumpData(), and LLMemoryView().